The easiest thing you’ll throw on the BBQ this Summer isn’t steak or potatoes, it’s pizza! Drizzle olive oil on your pizza crust and season with salt and pepper. Layer on the thinly sliced zucchini, sprinkle with most of the tarragon. Crumble cheese on top. Season with more salt and pepper. 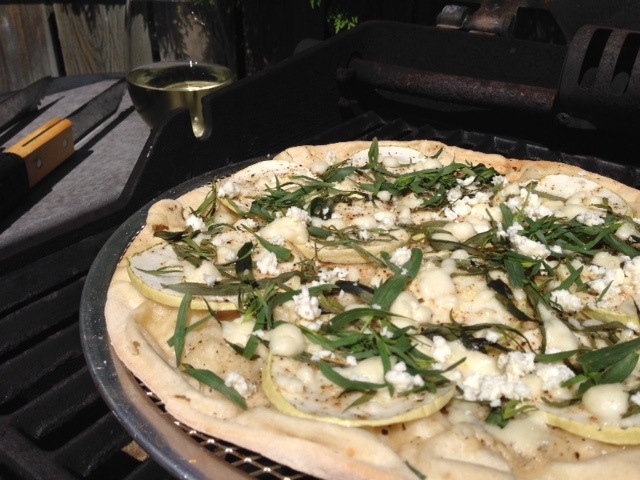 Bake at 350-400 degrees for 15 to 20 minutes on the BBQ – be sure to use a pizza stone or rack. Check to make sure your crust is crispy and golden brown. Remove from heat and sprinkle the rest of the cheese and fresh tarragon. Serve with a fresh side salad and a crisp white wine.